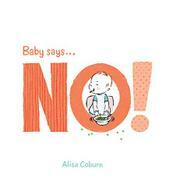 The baby says no to everything…except ice cream! The pictures tell the story in this board-book offering that highlights the antics of a noncompliant white toddler. The words are simple—until the very last page, the baby simply says “No.” “No” to relinquishing mom’s cellphone, to putting on any clothes other than a favorite bunny-rabbit suit, to dinner, to kisses from mom, to sharing, and more. Caregivers and children will immediately recognize themselves in these scenarios. For example, the retro-styled art depicts mom desperately trying to entice baby to wear a shirt with an ice cream cone on it, or a lion, or a lightning bolt, or a flying saucer. Baby simply holds up a hand, arm outstretched, oblivious to the mounting pile of clothes on the floor. When presented with various foods for dinner, baby’s faces of refusal are classic and hilarious. At the end, the family visits an ice cream truck, and baby finally says something aside from “No”: “YUMMY!” This isn’t a text that a caregiver can easily read to a little one, but the two can talk about what is happening in the pictures and how it might mirror their own experiences together.